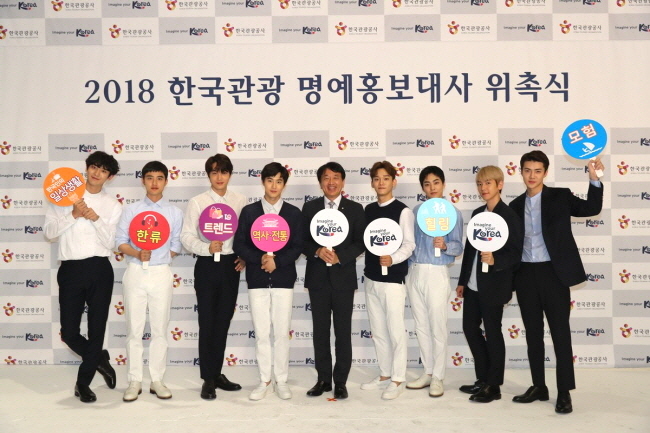 On June 23, Korea Tourism Organization has appointed popular K-pop idol group EXO as Korea Tourism Honorary Ambassador for 2018 to attract and increase international visitors. EXO members will be appearing in promotional videos that showcase unique experiences in Korea from the perspective of international tourists. EXO members will soon appear as the main cast in six different promotional videos that introduce Korea’s tourism divided in themes of history & tradition, Korean’s everyday life, adventure, trend, healing, and Korean wave. These videos will be released in August through television, Youtube, Facebook, and other digital marketing media.